Area residents now have the opportunity to walk on the wild side. 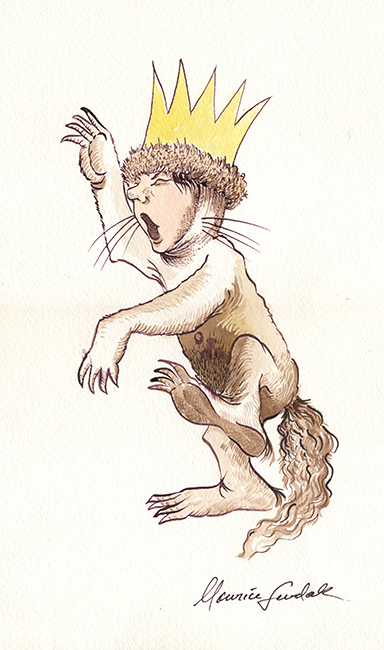 Monroe County Public Library is hosting the “Maurice Sendak Memorial Exhibition,” a collection of 50 illustrations from Sendak’s books, films, and television shows. While many of the drawings are from Sendak’s much-loved children’s book Where the Wild Things Are, others are from In the Night Kitchen, Really Rosie, and the Little Bear series. The library has planned a wide range of related programming and activities for all ages, including crafts for kids; a photo station that allows guests to take a selfie in front of a green screen and, within minutes, be emailed back their photo in a scene from Where the Wild Things Are; and a Wild Things of Sendak musical performance at both the main and Ellettsville, Indiana, branches on February 20. The exhibition will be open to the public from February 12 through March 26. Visit mcpl.info/sendak or use the hashtag #GoWildMCPL to find exhibit times and activities.